EOSpy-TI GPS-TI SensorTag — The GPS tracking automation and TI BLE SensorTag remote monitoring system is a complete package for business or office. EOSPY-TI wireless GPS tracking allows you to monitor your office, systems, personal property, and fleet from anywhere in the world. Receive remote information from any number of events like when an employee arrives on-site to where a vehicle is located. The EOSPY-TI SensorTag reader will read all sensors from the TI-SensorTag Bluetooth LE device. EOSPY-TI will send GPS position and remote sensor TI-SenorTag data for the following: temperature sensor, humidity sensor, ambient light level, SensorTag buttons, magnetometer, and other information. EOSpy Android client app allows you to use your mobile phone as a GPS tracking and TI BLE SensorTag sensor device. It reports location and additional TI BLE SensorTag information to EOSPY at selected time intervals. The EOSPY-TI Android client app also sends remote temperature sensor, humidity sensor, ambient light level, SensorTag buttons, and magnetometer information to the EOSPY live map server. Using an internet-connected or mobile cell network connected Android phone, location and environment information are at your fingertips. Remote streaming of additional information is possible like the following: accelerometer, magnetometer, gyroscope, IR temperature, barometer, and equipment status and condition. Monitor buildings, vehicles, and people from anywhere in the world. Stay connected and informed to what’s important. With remote live GPS map tracking information you can monitor real-time data anywhere, anytime using your internet-connected computer or tablet. EOSPY is easily set-up through the user-friendly map tracking interface that allows you to add any number of GPS tracking devices or Android phones. 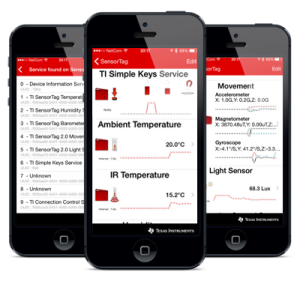 We provide everything you need to monitor and receive TI BLE SensorTag telemetry information in your business or office right now. EOSPY-TI will add support for more low power sensors – Connect Bluetooth Smart or WiFi sensors and get sensor data online in the GPS map. The EOSPY industry first IoT development enables easy and quick integration of sensor data with cloud connectivity. It offers low power wireless connectivity to be integrated into any product. Support for ten low-power sensors including ambient light, digital microphone, magnetic sensor, humidity, pressure, accelerometer, gyroscope, magnetometer, object temperature, and ambient temperature. The EOSPY-TI sensor supports six common types of sensors: an IR temperature sensor, humidity sensor, pressure sensor, accelerometer, gyroscope, and magnetometer. The first three sensors measure environmental conditions important to practically all devices located in the field. The IR temperature sensor, for example, warns if a device’s motor is overheating. 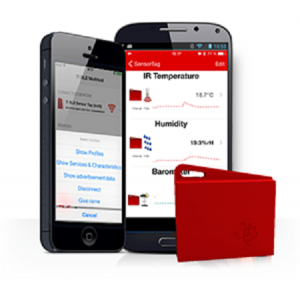 A humidity sensor can detect if moisture is penetrating a waterproof casing, and a pressure sensor can report on either excessive or substandard pressure. Taken together, these sensors can form powerful tools like a remote weather station. The accelerometer and gyroscope are especially important to mobile instruments as they allow a device’s motion to be tracked independently of GPS or other external location measurements. Most smartphones already have these features, but the sensor kit handles a wider range of conditions than most smartphone components. Finally, the magnetometer measures magnetic fields and electric currents, providing a safe means of remotely monitoring electric grids and power generators. You can visit the Google Store EOSPY-TI at Google Store to download the Free EOSPY-TI client to your Android device.